Lake Lugano (Italian: Lago di Lugano or Ceresio, from Ceresius lacus) is a glacial lake which is situated on the border between south-east Switzerland and Italy. The lake, named after the city of Lugano, is situated between Lake Como and Lago Maggiore. It was cited for the first time by Gregory of Tours with the name Ceresio in 590 AD, a name which is said to have derived from the Latin word cerasus, meaning cherry, and refers to the abundance of cherry trees which at one time adorned the shores of the lake. The lake appears in documents in 804 under the name Laco Luanasco. 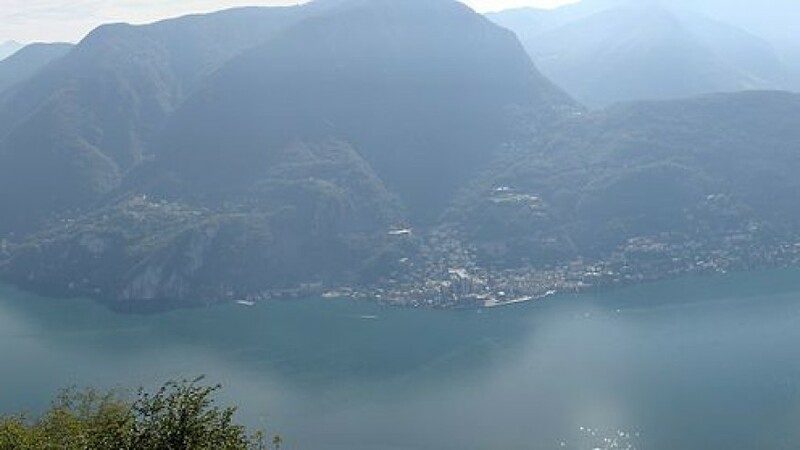 Well known mountains and tourist destinations on the shores of the lake are Monte Brè (925m) east, Monte San Salvatore (912m) west of Lugano and Monte Generoso (1,701m) on the south-east shore. The World Heritage Site Monte San Giorgio (1,097m) is situated south of the lake. The Italian waters of Lake Lugano area not included in the EU VAT area. The lake is 48.7 km2 in size, 63% of which is in Switzerland and 37% in Italy, has an average width of roughly a kilometre, a maximum depth of 288 m (944.88 ft) found in the northern basin. The culminating point of the lake’s drainage basin is the Pizzo di Gino summit in the Lugano Prealps (2,245 m). Bathing in the lake is allowed at any of the 50 or so bathing establishments located along the Swiss shores. The Italian waters of the lake and the exclave of Campione d’Italia are considered by Italian law as non-territorial for fiscal purposes and as such enjoy a special tax status as a duty-free area, exemption from EU VAT and offer residents other advantageous tax privileges. The Melide causeway separates the northern (27.5 km²) and southern (21.4 km²) basins, although a bridge in the causeway permits water flow and navigation. The lake retention time of the northern basin (11.9 years) is considerably higher than the southern one (2.3 years) (8.2 years on average). We also arrange events on Lake Maggiore & Lake Orta.